Nueva Ecija is a landlocked province in the Central Luzon region. It is referred to as the Rice Granary of the Philippines because of its vast greenery of rice fields. One of its municipalities is also called the "onion capital" of the country for being the largest producer of onions in terms of quantity. Most areas of the province are covered by plantations of a variety of agricultural products. Being known as such, who could have thought that it is home to this natural wonder? 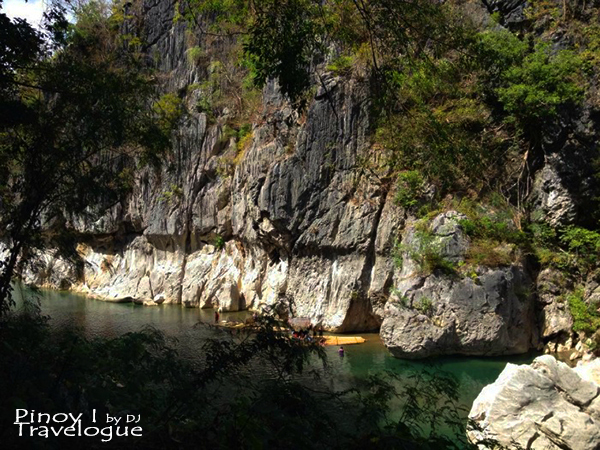 A river with pristine emerald water guarded by towering limestone formations on both sides of its bank. 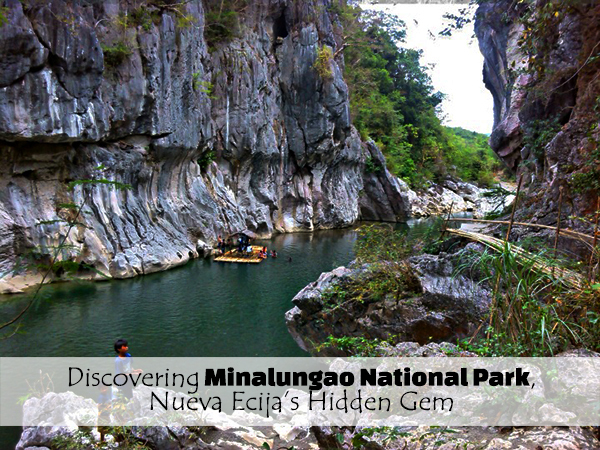 Enacted in 1967, Minalungao National Park is a protected area located in Sitio Minalungao, Barangay Pias, town of General Tinio. The park covers an area of 2,018 hectares featuring a breathtaking view of the narrow but deep Peñaranda River. The most distinguished feature of the park is the 16-meter high limestone walls bordering both sides of the river bank. I have never been to Nueva Ecija before. But thanks to my friend's cute and cuddly little daughter, I finally got the chance to visit this province and the park which I have been eyeing to see long before his daughter was born. Along with our colleagues, we rented a private van to get to Guimba, my friend's hometown, and attend to his Baby Bianca's christening in San Jose City. But the day before that event, we visited Minalungao which is on the other side of the province, approximately 2 hours away from Guimba. None of us know how to reach the park, though, so we got a little bit lost. Just a little bit. Hahaha! We took the Sta. Rita exit of North Luzon Expressway (NLEX) which is the nearest exit from Manila going to Nueva Ecija, and then we took several exits of other expressways in which I am not familiar with until we reached Cabanatuan City and realized that we were out of our way! 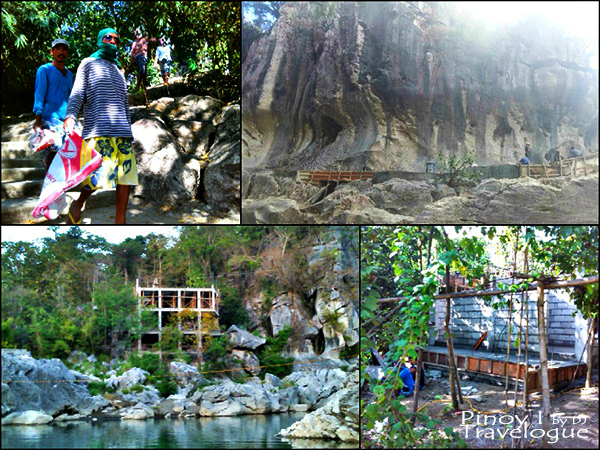 Coming from Manila, Minalungao is accessible via Gapan City so we turned back. Even in General Tinio itself, we had a hard time searching for this hidden wonder but that was due to lack of signage pointing to the park. In less than 6 hours, with the help of some Nuovo Ecijanos whom we asked directions from, we finally reached the park! Normally, the park can be reached in less than 4 hours from Manila via private car. As of writing, there is a more or less 20 minutes of driving on bumpy and unpaved parts of the road but concrete roads are already being constructed. To commute, hop on a bus bound for Cabanatuan City then alight at Gapan City. From there you may hire a tricycle going to Minalungao. Or you may go to General Tinio and hire a tricycle there instead. It is advised to rent a tricycle for a round trip since the park is in a remote location a way far from the town proper and there were no public transportation available yet. That was the reason why we opted to rent a van for this trip. Local tour guides are readily available upon reaching the entrance of the park. Even kids can be your guide just like ours, Verano, a 12-year old guy. We were reluctant at first but I can say that the kid knows the place very well. There is no fixed rate for getting a tour guide but it is customary to give them any amount since it is their means of living and it may help those kids with their schooling. 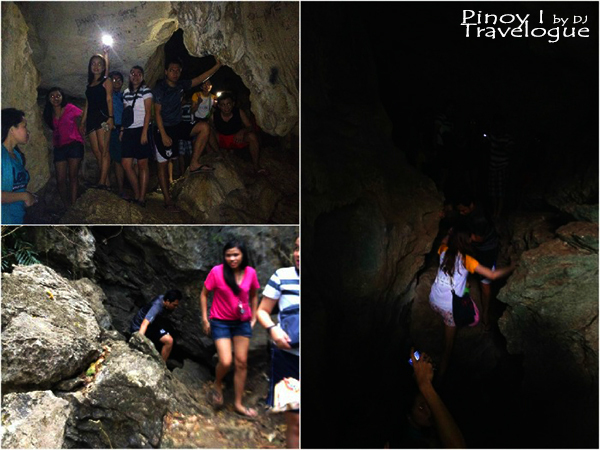 On the side of the limestone walls is a series of caverns where crystalline rock formations are a spectacle. Concrete staircases built on the limestone walls provide easy access to the caves and help avoid untoward incidents. 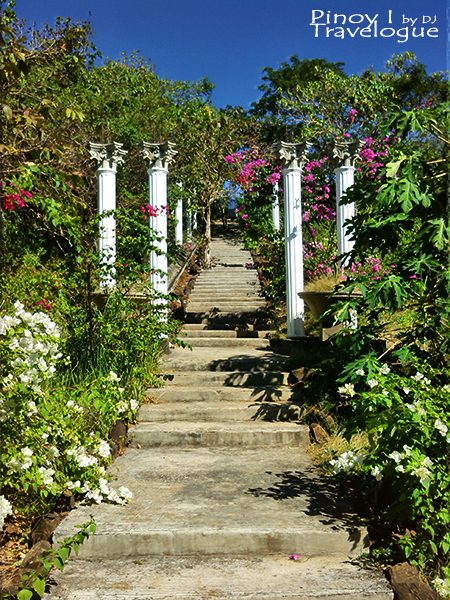 But some parts of the stairs are steep and requires extra care while trekking. 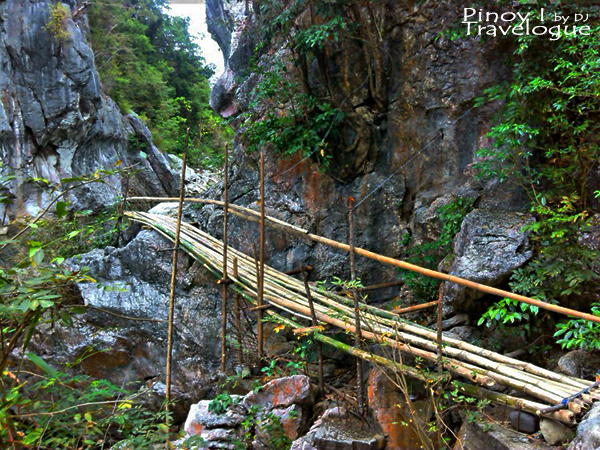 Several bamboo rafts rowed by locals were used to take tourists to any point of the river. 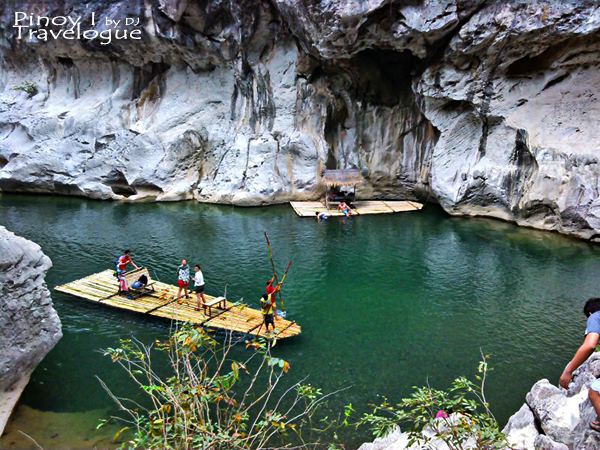 Aside from trekking the limestone walls to reach the cave, you may also ride on a raft to reach the point nearest the cave entrance. 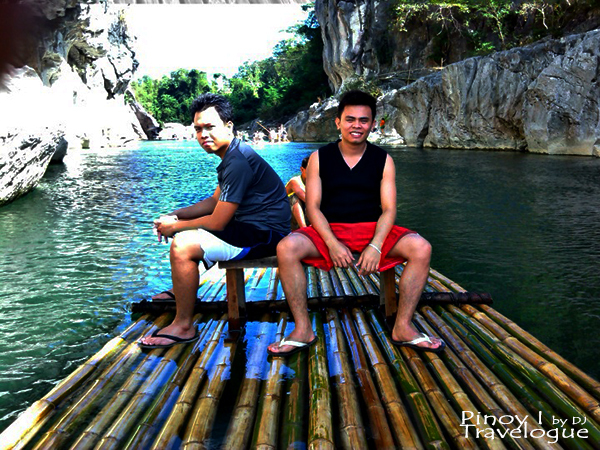 We did the trekking so we just took the bamboo raft ride to take us to the other side of the river where we would do our next activity. 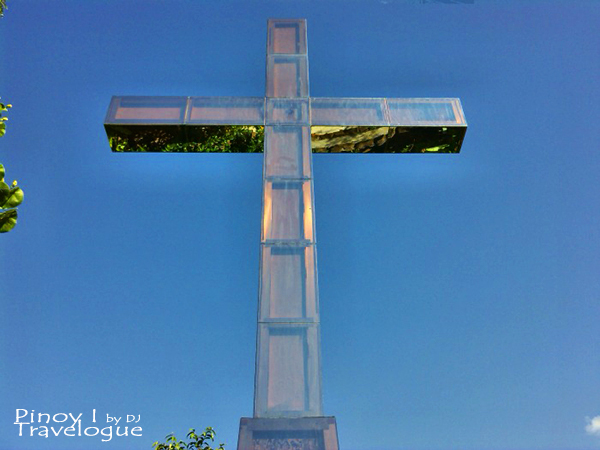 Another fat-burning activity the park has to offer is a thousand-step hike that leads to a small garden with a giant cross structure on the summit of the hill where it stands. 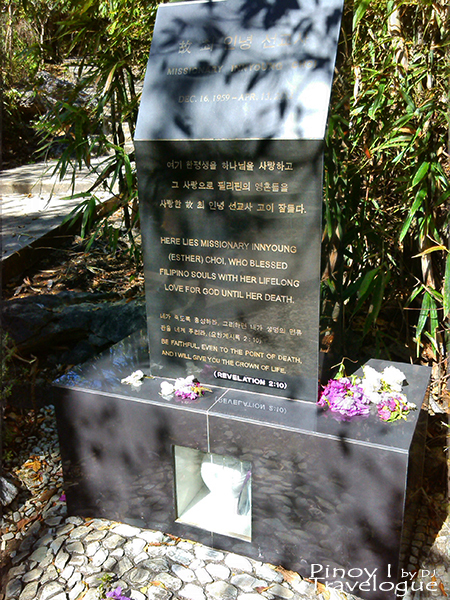 Along the way, we passed by a tomb of a Korean missionary. According to our guide, the missionary loved the place that she willed her remains to be buried here when she dies. Maybe the most exhilarating activity on the park is diving from a boulder sitting in the middle of the river. We were amazed by the local kids who fearlessly jumped a couple of times. We did not take the risk for this activity though. We stayed on a floating cottage, took our afternoon snacks there, docked it to a part where the water is shallow and refreshed ourselves with the cool waters of the river. There is also a row of stationary cottages lining the perimeter of the bank available for rent. The surface of the river floor is uneven. A part next to a shallow water can be too deep so it is better not to swim alone. Minalungao National Park is truly a natural marvel that brings anyone closer to Mother Nature. But several construction projects are conspicuous around the area. Recently, I heard that there is a 2-year Development Program for the park and the construction has already been started. This program includes construction of amenities such as hotel and resort, zipline, cable car and other special interests. I believe in these efforts of the government to boost the park's ecotourism potential and its benefits to the local residents. But somehow, the natural landscape can be destroyed and the protection of the area may be compromised. I feel lucky that I was able to visit this place while its beauty is still on its natural state. Hopefully, this natural beauty may be witnessed by the coming generations, especially that of our beloved Baby Bianca. 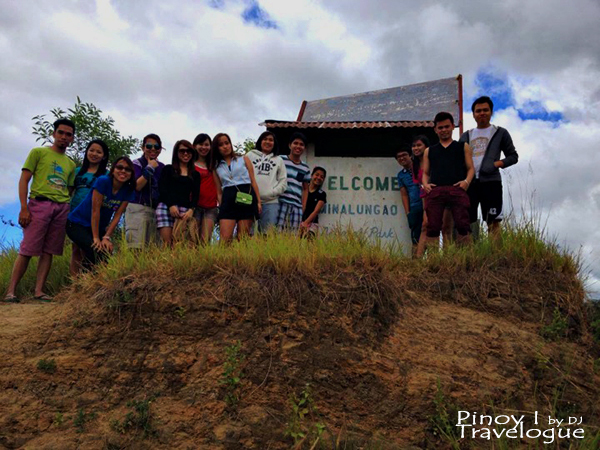 Thanks for sharing your wonderful experience in Minalungao. Its discovery by many people from various provinces in the Philippines through social media will erase the impression, "Nueva Ecija has nothing to offer but rice fields." You will appreciate more the allure of Minalungao National Park if its waters is emerald green which complements the natural beauty of this wonderful nature park. 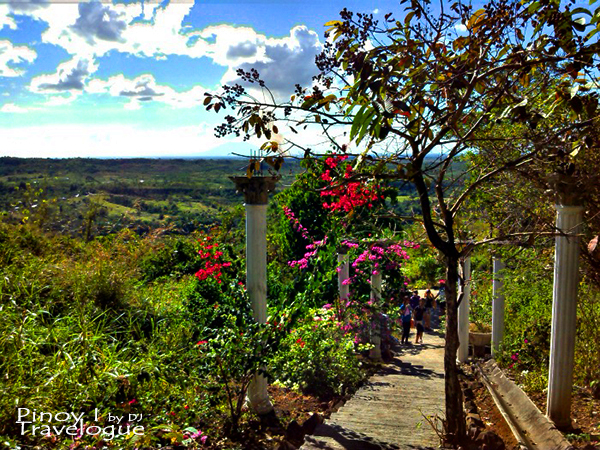 There are other interesting tourist destinations in Nueva Ecija which were recently discovered and promoted like the five hiking spots which include Mount Kaanducian in the town of Pantabangan, Mount Dilalam in the town of Bongabon, Mount Sawi in Gabaldon, Mount Mapait in Palayan City and the most popular of them all, Mount 387 (Batong Amat) located in the municipality of Carranglan. 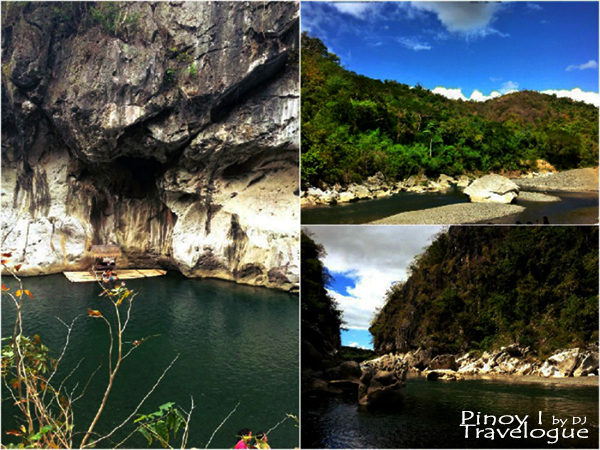 Pantabangan Dam/Lake is one of the most visited tourist spots in Nueva Ecija. Isdaan Floating Resto-Fun Park is another recently opened tourist destination in Nueva Ecija located in the town of Talavera. It’s a 9-hectare Asian-inspired foodie theme park full of huge animal statues, Buddhas, cartoon characters, and Thai gods. The oldest colonial Roman Catholic church in Nueva Ecija is the Virgen La Divina Pastora also known as the Three Kings Parish Church located in Gapan City, the Slipper Capital of Northern Philippines. The Science City of Muñoz is the site where agricultural research centers are located which include the Philippine Carabao Center, Philippine Rice Research Institute and many more. 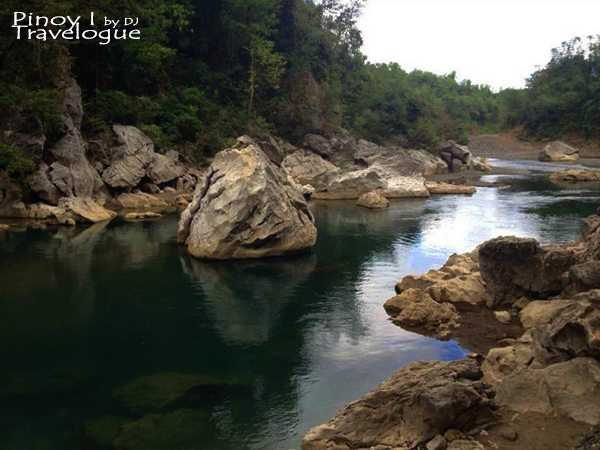 There are additional interesting spots (historical sites and many hidden waterfalls) in Nueva Ecija that you may visit. 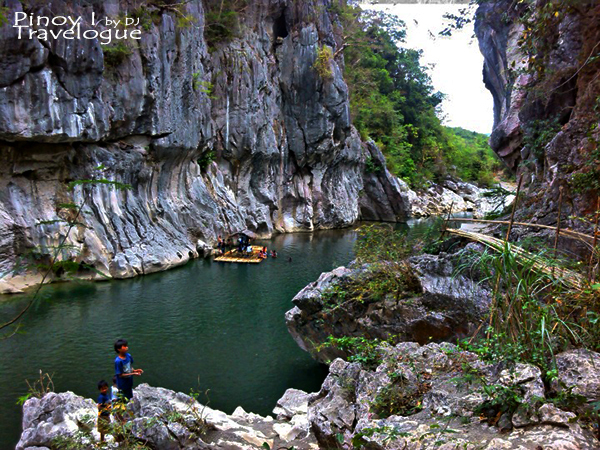 Explore Nueva Ecija to appreciate its beauty and bounty. 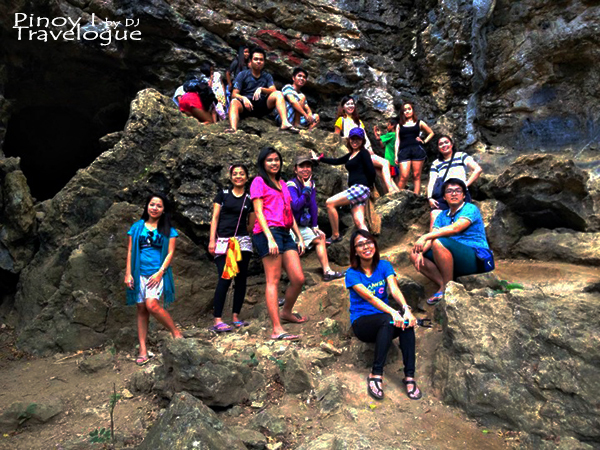 Contents of this personal blog are owned by DJ of www.pinoytravelogue.com unless otherwise stated. 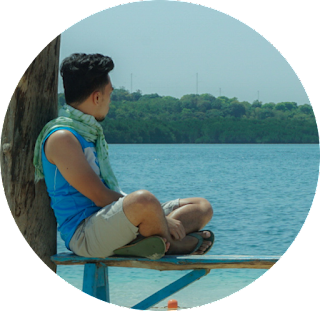 Since traveling is all about sharing the fun and experience, I'm more than glad when you share my trip stories and travel photos. However, I humbly ask you not to reproduce the whole content without my permission and proper credits. Kindly provide a link to this site or to the specific blog entry in your excerpts. I use watermarks in every photo to clearly suggest copyright, though they are nicer to look at without those. 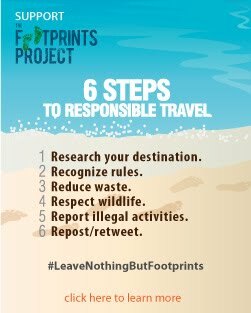 Should you feel like using any part of this travel blog, kindly contact me and I'll be happy to work with you. Salamat po!